I went to the zoo to see a baby giant panda! Aww, she was so cute! She was sleeping at the top of the tree most of the time, but woke up once when I walked past by her room. ：D Yatta! She lives with her mom in the same room. The mommy panda reminded me of my mother. The daddy panda lives next door. He was walking around. I am sure there was a man inside the panda. A middle-aged man, probably. When the panda looked down at the small pond, he looked like a man who has a hangover. *のっそ のっそ (the onomatopoeic word) It expresses something or someone is moving ponderously/sluggishly. *ぼり ぼり (the onomatopoeic word) The sound of scratching or crunching. It just looks like a middle-aged man to me. It would be a little confusing, so I show you some more examples. It looks like a middle-aged man. It doesn't look like a middle-aged man. (3)If I say おじさんにしか見えない, then it really looks like a middle-aged man, and it doesn't look like other things. interesting!! 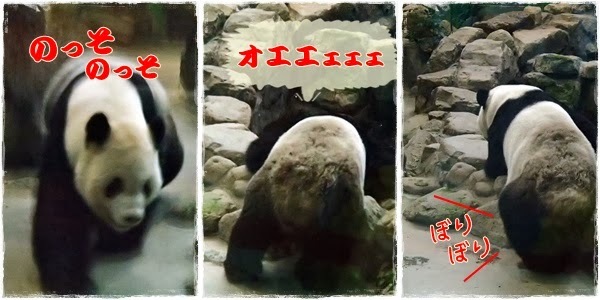 But how can you image a cut, giant, popular panda to a middle-age man XD !? This old man has lots fans right now.